The Poly-Mart 500 Gallon Sunshield Rain Harvesting Water Storage Tank is your best bet for collecting rainwater. 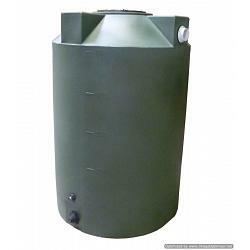 Poly-Mart is proud to bring the most advanced line of plastic tanks to the market! This premier line of patented tanks feature a molded-in SunShield Layer of food grade black polyethylene to eliminate UV light penetration from the sun. This inner layer is made from the same virgin food grade material as the outer layer of the tank, but with the added benefit of being compounded for complete sunlight protection. These two layers are seamless and are molded together at the same time, making the inner and outer layer one complete seamless wall. Testing from Texas A&M University proves these tanks measure Zero UV light intensity when placed in the full sun, even in the lightest colored tanks. Ever wondered why plastic storage tanks are mainly sold in Black & Dark Green colors? Those colors are naturally dark so they typically let in less light than other colors. With SunShield, color is no longer an obstacle! Testing proves our new Arctic White color w/ SunShield will keep your stored water up to 14 degrees cooler in comparison to your standard colored dark green plastic tank on the market as the Arctic White color reflects light! In hot climates, this is important for controlling evaporation and allows the water pumped indoors in Summer months to be a little cooler! Featuring an industry leading 10-Year Manufacturer's Warranty, these tanks are built to last and are available in our Water Storage, Rainwater Harvesting, First Flush and Emergency Water Storage versions! 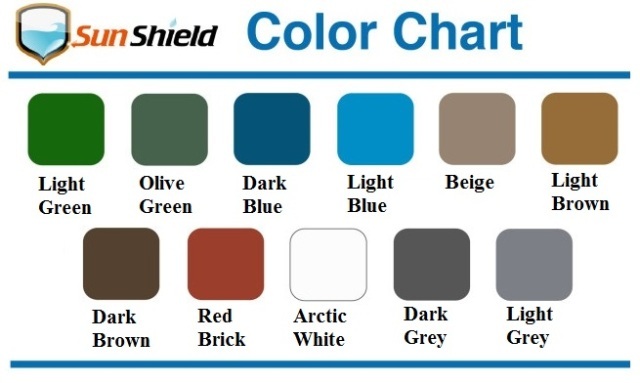 Poly-Mart offers the largest tank color selection in the industry with 13 available colors. Our Black and Dark Green colors allow zero light in the tank so the SunShield layer is not necessary in those two colors. However we are proud to continue setting the standard by offering the SunShield Tanks in our remaining 11 colors! No matter the color or tank size Poly-Mart's SunShield Tanks are superior to any other option available today and will best protect your water from the effects of the sun. Thirteen Colors. Zero Light. One Clear Choice. Don't settle for a plastic tank that requires retro-fitting in order to properly collect rainwater! Poly-Mart manufactures a line of Rainwater Harvesting Tanks sold exclusively through Retail and Online distribution, that come included with all the fittings needed to immediately start collecting the rain! Our Rain Harvesting Tanks are available in various sizes as well as eleven different colors! Like all of our Vertical Tanks, the Poly-Mart 500 Gallon Rainwater Harvesting Tank is designed with 4 Dome Flats on the top of the tank and 4 Layout Flats at the base of the tank. These 8 Flats set our tank design apart from others and provide flat surfaces for installation of additional outlet/inlet fittings, Tank Over Flow Fittings, Float Switches, Tank Gauges and other Rainwater Harvesting Accessories. Your Installer or Contractor will love having flexibility when needing to install additional fittings where you need them most in your application. Poly-Mart 500 Gallon Rain Harvesting Tanks come standard with a 16" Stainless Steel Strainer Basket affixed to the top of the tank with stainless steel hardware. The strainer basket is the entry point of the tank and keeps large debris like sticks and leaves from getting into the rainwater tank. There is also a stainless steel screened overflow assembly, outlet bulkhead fitting and a 3/4" bulkhead fitting for a water hose spigot. The stainless steel screened overflow assembly is designed for directing overflown water during large rain storms while keeping pests & mosquitoes out of the tank. Our 3/4" bulkhead fitting is placed at a height that enables you to install a spigot and fit a watering can underneath for filling. Do not drink collected rainwater without proper filtration. Please contact your distributor for proper filtration methods. Want To Know More About Sunshield? Poly-Mart Sunshield tanks carry a 10-year limited warranty from the manufacture date. The warranty covers manufacturer defects. Poly-Mart is liable for the value of the tank itself and specifically excludes the cost of labor for installation and/or removal of personal property. We are also not liable for personal/property damages. Poly-Mart is not liable for tank failure if the tank is damaged by the customer. Poly-Mart water tanks are for water applications only. Painting or any other structural changes made to the tank voids the warranty. 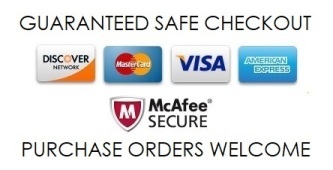 For our complete 5-year limited warranty details, please click this link.